There is no doubt that Neapolitan Song has been a central genre in the development of what we now call ‘Popular Music’: probably no other urban song has achieved such a world-wide notoriety and certainly Neapolitan Song helped to expand the myth and the appeal of the city of Naples itself pretty much everywhere. How many among us, though, know about that ‘branch’ of Neapolitan Song that happened to find its way up in the United States since the beginning of the 20th century? Yes, everybody knows Enrico Caruso, but he was only the most famous of a large group of performers who travelled to New York, and often back, becoming some sort of ‘birds of passage’. And it is this ‘pendular’ image that inspired Neapolitan musicologist Simona Frasca in writing Birds of passage. I musicisti napoletani a New York (1895-1940), recently put out by the Italian publisher LIM (215 pages, illustrated, 23 euros). The author, with an approach which considers both sociology and ethnomusicology, tells us of this very peculiar story in what is virtually a unique book. Birds of Passage is the story of a community forced to leave their native land and shape a new identity in another nation: in such an effort, song becomes a privileged tool but, beyond the traditional repertoire brought with them from Italy, the ‘American Neapolitans’ soon create a new one, which is still largely unknown, even in Italy, and which testifies of the way they perceived the New World. 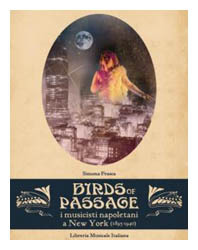 Birds of Passage leads the reader along all the steps of this journey: the music publishing industry, the advent of the record, the discovery of new dance metres like foxtrot, shimmy, rumba, tango (which immediately paired off with the traditional Neapolitan melodic taste), the lyrics and the scores. The originality of this work lies also in the way it helps penetrate the mental universe of a repertoire whose knowledge was, so far, only limited to few experts. Discussing a song like Chist’ è New York (‘This is New York’), for example, recorded by Giuseppe De Laurentiis in the 20s, Frasca shows how a whole ‘vision’ of America surfaces when the overcrowded subway, the tall buildings, the speed which moves everything seem to arouse contradictory feelings in balance between charm and awe; similarly, in ‘Mpareme ‘A Via D’ ‘A Casa Mia (‘Show me The way To Go Home’), adapted by Farfariello from a pre-existing American composition, Broadway looks like a dreadful maze which only makes him willing to go back home. Together with Giuseppe De Laurentiis and Farfariello, all the main protagonists are mentioned: Armando Cennerazzo, Alfredo Bascetta, Teresa De Matienzo, Joe Masiello… people still waiting for proper recognition, especially in their homeland, as of this ‘American generation’ maybe only Caruso and Gilda Mignonette are real stars in the memory of amateurs. Birds of Passage promises to be a reference book for all those interested in understanding this other side of the protean nature of Neapolitan Song.